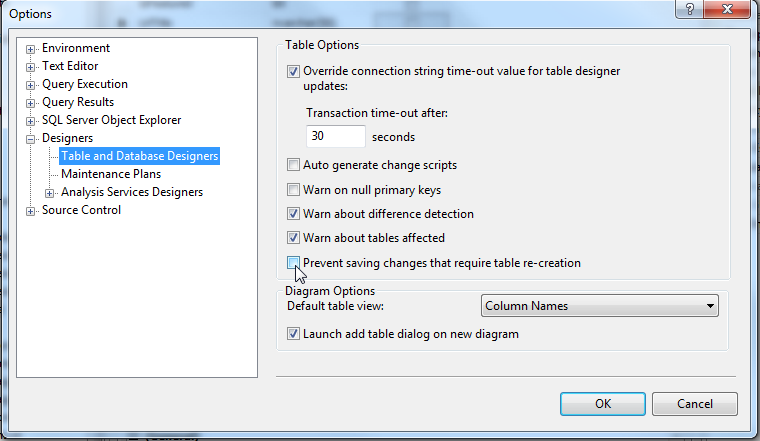 I got this notification when I changed a table's column to NOT NULL and tried to save: "Saving changes not permitted. The changes you have made require the following tables to be dropped and re-created. You have either made changes to a table that can't be re-created or enabled the option Prevent saving changes that require the table to be re-created." This is because the script generated would contain a DROP TABLE statement. Of course it would have saved everything in a temp table before being dropped and re-created the table so nothing would have actually been lost. 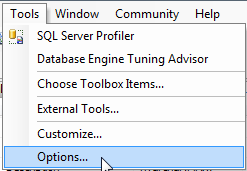 Even still, it is probably a nice little safe guard for those who maybe aren't that used to SQL Server but I am so: how to get round it? If you are confident that you are a legend with your SQL skills and you just want to be left alone you can disable this warning. Go Designers » Table and Database Designers and then uncheck "Prevent saving changes that require table re-creation"
Job done - enjoy at your peril!